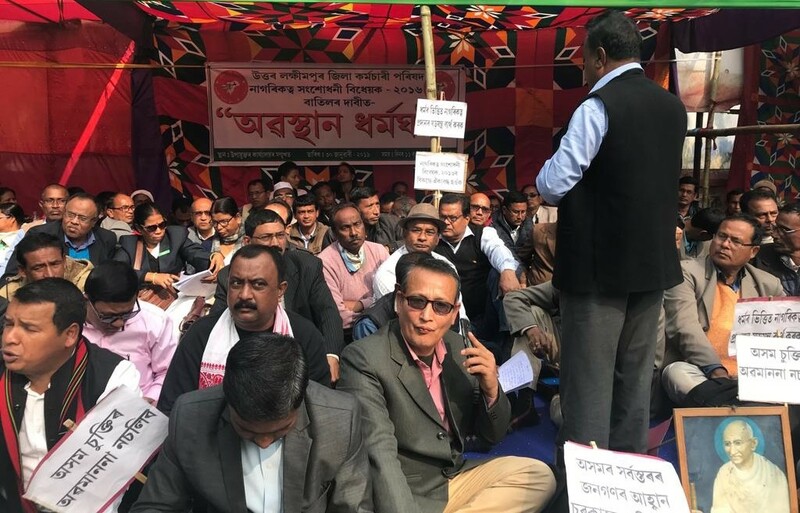 Sodou Asom Karmachari Parishad (SAKP) stages sit-in demonstration in North Lakhimpur against Citizenship (Amendment) Bill on January 30,2019. Image: Northeast Now. The ongoing protest against the controversial Citizenship Bill, 2016 took a major turn as the influential Sadou Asom Karmachari Parishad (SAKP), the largest union of state government employees of Assam, took to the street in North Lakhimpur as part of a statewide stir. The SAKP observed a boycott of their jobs in protest of the bill and organised a sit-on protest in front of the Deputy Commissioner’s office North Lakhimpur. The SAKP members shouted ‘Job is not greater than homeland’ in unison at the protest site which was also attended by workers and employees of various offices and organisations, students, lawyers, civil society members, senior citizens. 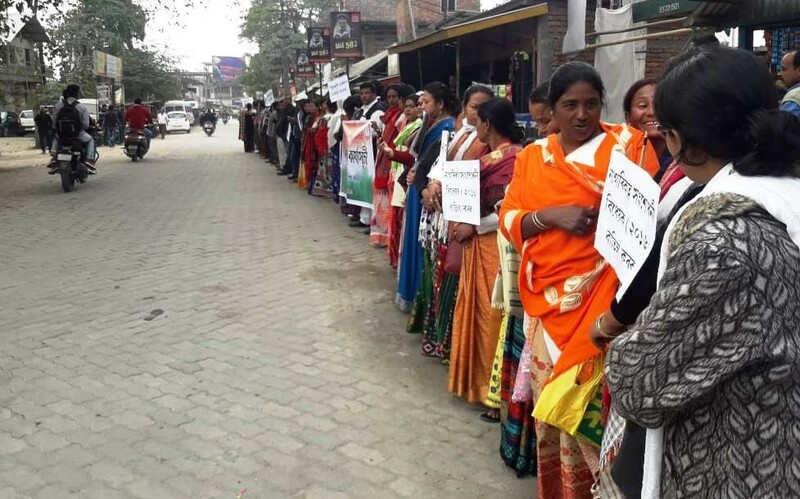 Congress members form human chain in North Lakhimpur on January 30, 2019 in protest against Citizenship (Amendment) Bill, 2019. Image: Northeast Now. “The martyrdom of their fellow employees in the past had been a source of inspiration, courage for SAKP to get ready for more revolutionary acts of patriotism,” they said. The sit-in demonstration of the SKAP was also attended by AASU, All Assam Tribal Sangha and many others. Meanwhile, Lakhimpur District Congress Committee formed a human chain in North Lakhimpur on Wednesday against the Citizenship Amendment Bill, 2016. More than five hundred people participated in that human chain stretching from the Deputy Commissioner’s Office to the North Lakhimpur Girls’ HS School Chariali.